By the end of the 17th century the Dutch designed city fortress of Gothenburg was one of the most well defended in Northern Europe, surrounded by walls, bastions and a moat. This picture from 1709 was part of the 'Great Power' propaganda and I don't think that all these defense systems was really this complete or this well kept. Picture detail from Dahlberg, Suecia Antiqua, Gotheborg, 1709. The city of Gothenburg was granted its charter in 1621. The city was founded to become a lock and defence to the important Göta River outlet into the Northern Sea. Its position was strategic and ideal for trade. The area around the mouth of the River Göta - formerly Vike Fjord, had been an important trading centre since the 12th century and indeed quite likely a Viking Stronghold. King Gustavus Adolphus II decided that the city would be ruled by twelve councilors. The high council was made up of 4 Swedes, 3 Germans, 2 Scots and 2 Dutch. The Germans were regarded as good organizers, the Scots as entrepreneurs and the Dutch for their skills as city planners and knowledge of canal systems. 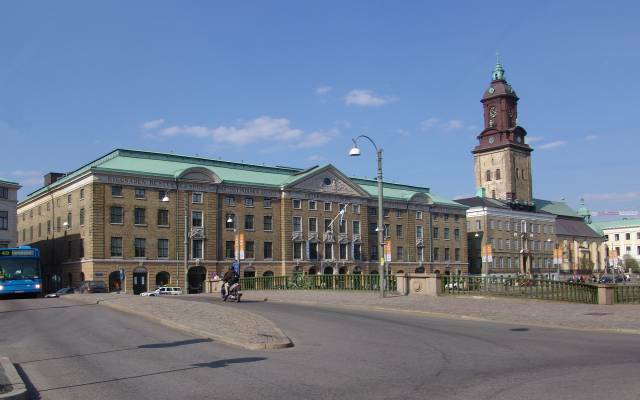 The city was built according to Dutch patterns in the same manner as 'Batavia' (Jakarta) and 'New Amsterdam', today better known as New York, with streets and manmade canals in a geometric grid pattern with a central city harbour canal and next to it a large square, the current Gustaf Adolfs Torg. 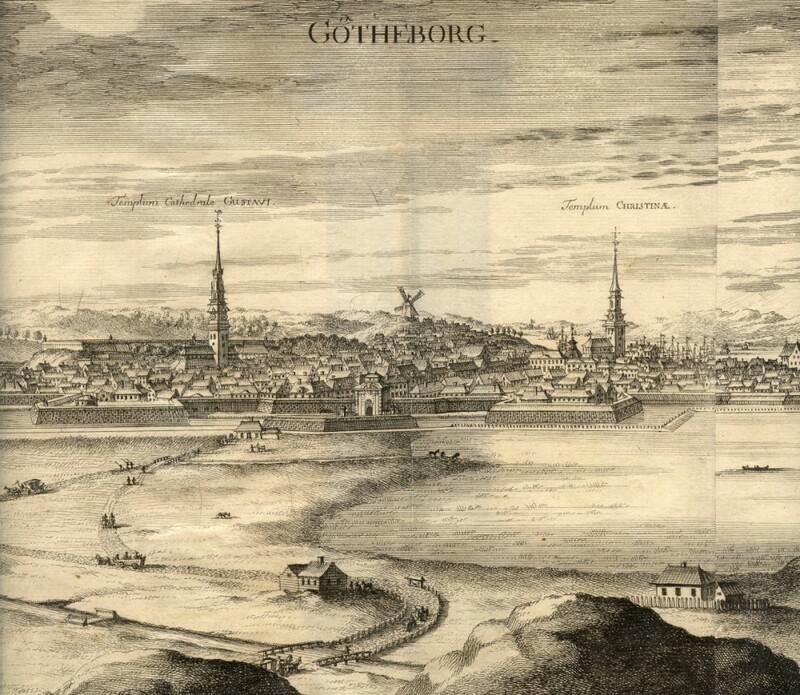 By the end of the century 17th century Gothenburg was one of the most well defended fortresses in Northern Europe surrounded by walls, bastions and a moat. Three of the fortresses that were built outside the city still stand - Kronan, Lejonet and the river mouth fortress New Älvsborg. Among the more important buildings we still have from the original city plan from the 18th century, beside the churches, streets, canals moat and fortresses, we find the East India Company Building still along the central city harbour, - originally a warehouse, auction room and office for the East India Company and the 'Crown's house' right behind the East India Company Building - where the artillery had its magazine for ammunition and grain, and their workshops. Immediately in front of the former EIC office and warehouse is still the Residence of the County Governor's. City of Gothenburg down to the right. In the middle of the map we see the Gota Älv River flowing from east to the west. Just outside the map to the left is the New Älfsborg Castle. Map from 1815. The East India Company, which turned Gothenburg from a rather drab fortress into a flourishing merchant's city, was founded in 1731. The following year, the first East-Indiaman set sail for China to arrive back already next year and by auctioning its return cargo of tea, silk and porcelain at a spectacular profit, set the stage for a new era. With the industrialization during the 19th the appearance of the city changed dramatically. The houses in the central areas grew larger and more solid while former farmland around the city was developed with mostly wooden houses in Haga, Masthugget and more, to house the workforce of the newly established industires. The city walls were demolished and gave way for green parks and alleys expanding the city to encompass newly developed areas such as Vasastaden and Olivedal. Some of the canals were filled in and the harbours and quays were extended along the Göta Älv River. Famous central buildings, which have been preserved from this century, are the 'Bourse' Stock Exchange, the Central Railway Station, the Opera, the 'Fish church' and the 'Saluhallen' wet market. This text was prepared by Bengt Johansson, Jan-Erik Nilsson, and Anders Wästfelt, for an exhibition in Shanghai 2005.